The UEFA Nations League might not have been welcomed by some clubs across the continent — Liverpool manager Juergen Klopp called it “the most senseless competition in the world of football” — but it has generated plenty of intriguing story lines to pique interest in its inaugural year. The competition has reached its final set of qualifying matches, and results over the next week will determine which teams will feature in a Final Four mini-tournament in June — when the first Nations League champion will be crowned. Currently, France, Belgium, Portugal and Spain are favorites to be the finalists. The upcoming matches will also establish which of the lower-ranked teams qualify for the Nations League playoffs, from which one place at the 2020 European Championship will be awarded. France, the world champion, has won two of its first three group games and will advance to the Final Four with a win over the Netherlands in Rotterdam on Friday. A victory for the Dutch means they can then qualify by beating — or potentially even drawing with — Germany in the group closer in Gelsenkirchen on Monday. France has seen four players, including Paul Pogba, withdraw from the squad through injury on Monday. Germany is last in the group, having collected one point from three games, and is on the brink of relegation to League B featuring Europe’s second-tier nations. 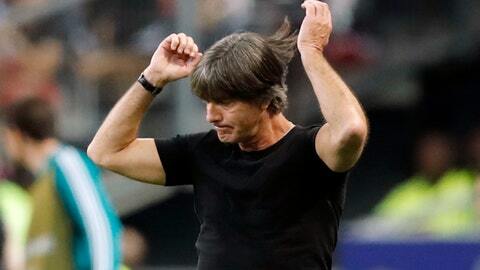 Coming after a World Cup where the team failed to get out of the group stage, coach Germany coach Joachim Loew’s decision to stay on in the role is under as much scrutiny as the team’s mettle. Iceland has already been relegated after losing its first three games, leaving Belgium and Switzerland — tied on points — to battle for first place. The Belgians have played a game less, so a home win over Iceland on Thursday will leave them three points clear heading into the group decider in Switzerland on Monday. Belgium is the world’s top-ranked team and will look for revenge for its semifinal loss to France at the World Cup if it does reach the Final Four. There is an added emphasis on which of Portugal or Italy advances, considering the team that qualifies from this group will host the Final Four in June. Portugal is the favorite after winning its first two games, without needing Cristiano Ronaldo, and needs only a point away to Italy on Saturday to guarantee first place. If Italy wins, Portugal can still finish top with a home win on Tuesday over Poland, which has already been relegated after picking up just one point from its first three games. Spain looked on course to qualify comfortably from a group also containing England and World Cup runner-up Croatia after beating both teams in its first two games. Losing to England 3-2 in Sevilla last month, in arguably the standout match of the entire group stage so far, has kept things alive. If Spain loses to Croatia in Zagreb on Thursday, England can finish first with a win over the Croats at Wembley Stadium on Sunday. Spain coach Luis Enrique has called up Barcelona left back Jordi Alba for the first time since taking charge of the team after the World Cup. Ukraine became the first country to secure promotion to Group A for the second Nations League, in 2020. Bosnia and Russia are well clear in their groups and need one point from their final matches, against Austria and Sweden respectively, to also ensure promotion. In the other group in League B, Wales and Denmark are fighting for first place. They meet in Cardiff on Friday, when a Welsh win would guarantee them top spot. It means the so-called minnows of Europe have something tangible to play for. No teams have won their group so far, though Finland is close after winning its first four games in Group C2 and needs one point from its last two. In Group C1, Israel and Scotland are batting for first place; in Group C3, Norway and Bulgaria are tied on points with two games left; and in Group C4, there is a three-way fight between Serbia, Montenegro and Romania. In the league containing Europe’s weakest countries, Gibraltar and Kosovo — two of the newest members of UEFA — have claimed their first ever competitive international wins. Kosovo is top of Group D3, two points clear of Azerbaijan with two games left. Gibraltar is second behind Macedonia in Group D4. Georgia has won Group D1, and Luxembourg and Belarus appear to be fighting for first place in Group D2.